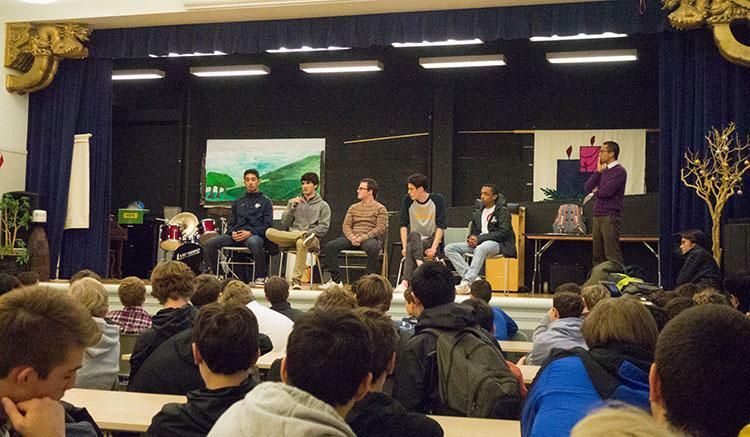 Five alumni college panelists speak to students during assembly on Monday. The panel is an annual event put on by the College Counseling office. Five Stuart Hall alumni returned to the Pine and Octavia campus this morning to speak with the current student body about issues relating to college life. The panel gave specific advice on how to succeed with standardized tests and the navigation of the college process, shedding light on how to manage roommates, course loads, and work-life balance in college. The panel answered questions from the community as well as College Counseling Director Cesar Guerrero, and they added their own anecdotes. Charlie O’Connell ’16, who attends Colgate University, encouraged students to get involved and take ownership of their time at Stuart Hall. The graduates shared their perspectives on issues that they face in college such as staying motivated and focused on succeeding in school. The panelists ended the session by sharing some advice with the students.